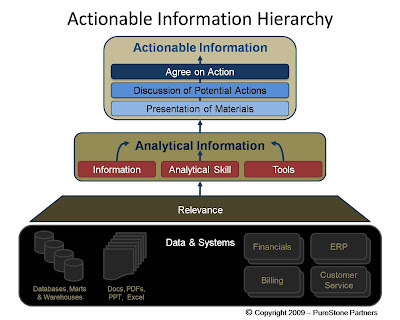 I work on many projects where the outcome is “just provide us actionable information.” While this is always the goal, I find most people use the term quite loosely, as if it were merely an additional option. In reality this is quite difficult to create. Many things need to come together to create action, and it is far more than just information or a report. To create effective actionable information, we need to integrate people, information, and tools. We also need to have the right skills at different times. All too often, the expectation is for IT to write a single report that will answer all questions. Yet, what typically happens is the report creates more questions as IT cannot predict every need. All this has done is create more activity for IT and delayed action. First, we have a tremendous amount of data. And it would be easy to argue way too much data, hence the need to create layers of relevance. How often do we get lost looking for what we need, or recreate something because we don’t understand the business rules of the data we find? This wasted effort costs the business money and time. We have the information, now we need a good analytical mind to review the data to create analytical models or what-if scenarios. What typically happens here is a finance or IT analyst runs a few numbers. This is probably OK for many instances, but the best option would be both a mind of the business as well as a statistical curiosity (though at this stage we need more of a statistician). IT and Finance often lack both of these to some degree – as their primarily skill is data or fiscal governance. Now we have some level of analytical information, but still have work to do. In general, the statistical mind tries to cram in too much detail and wants to discuss the process of discovery, instead of the finding. To transform analytical information into action, we need the business to present the finding in executive terms – value created. The presentation is more than likely to include multiple reports, synthesized into a couple charts. The next step is to foster a discussion of the recommendations and potential options. The discussion will focus on gathering feedback and coalescing them into an agreed upon plan. It is common here for people not to feel comfortable with the information and ask for additional information and analysis, but we need to fight the urge to delay and put the best foot forward. There will be times when the need for rework is great, but if the discussion includes the right people and the facts then there should be enough to make a decision and move forward. Otherwise, the risk is creating a culture of endless analysis.